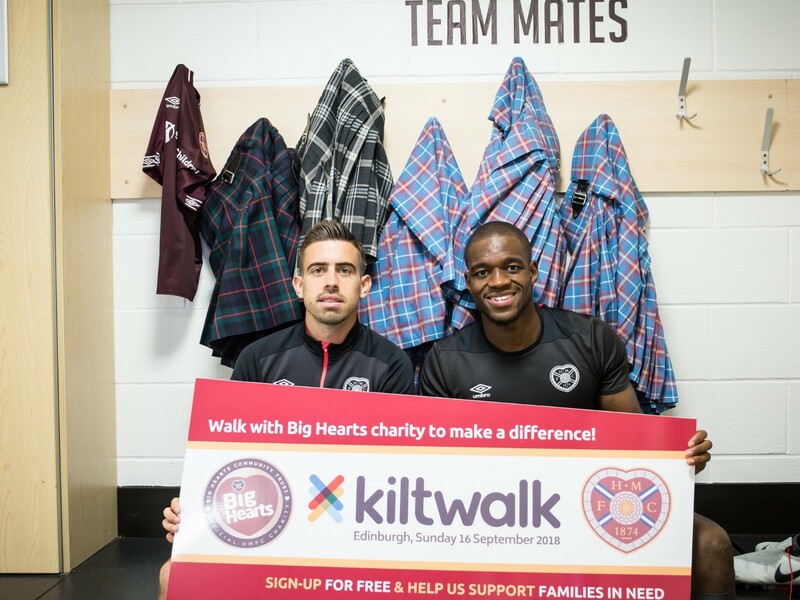 First team players Olly Lee and Uche Ikpeazu took a break from their training at Oriam to recognise the fantastic efforts from the Hearts fans who will represent Big Hearts at the Edinburgh Kiltwalk on Sunday! A team of 22 Big Hearts Supporters will take on the Mighty Stride (24 miles) or Big Stroll (15.5 miles) across the city to raise funds in aid of the Club’s official charity. Big Hearts supports hundreds of local individual and families affected by social isolation and the generous donations will help continue our charitable work to improve the lives of the most vulnerable groups in South West Edinburgh. We are thrilled to reveal that over £3,000 have been raised so far – and with the 40% top-up from The Hunter Foundation on every pound raised, we are expecting to break another milestone after the event! Every Hearts fan walking for Big Hearts this weekend will get the chance to join the largest Edinburgh Kiltwalk to date, with a set of entertainment along the route, live music after the finish line at BT Murrayfield and the chance to win a brand new Vauxhall Corsa from Arnold Clark.